Local rules, services, businesses and features about the largest small boat harbor system in Alaska! 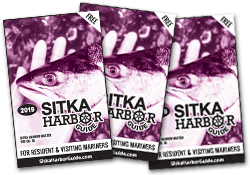 Sitka Harbor Guide All Things Harbor! If you count it all up, Sitka has more than 8 miles of city docks – the largest small boat harbor system in the entire state of Alaska. One thousand three hundred stalls. But that’s still not enough – there are more than 300 vessels waiting for slips. 2014 welcomes a completely refurbished ANB Harbor. Sitka Harbormaster Stan Eliason said everything was replaced – floats and fingers, electrical and water hookups, even the main pilings. The approx. $7.5 million project was funded through a 50/50 match with the state. ANB’s new configuration accommodates 94 vessels of various sizes, a few less than the old setup. Eliason said some slips were made larger and others were eliminated to ease bottlenecks. There are now some 55-foot stalls. Eliason said the next major project will probably be a $5.4 million re-do of the transient dock – 1900 feet of moorage (both sides) – used by every sort of vessel from local boats to visitors’ and commercial fishing packers to luxury yachts. 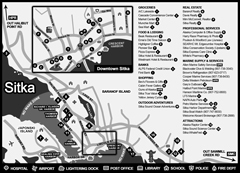 The transient dock is located just north of the Harbormaster’s Office. The facility needed emergency repairs about a year ago, requiring other maintenance to be deferred. “It’s 40 years old and in dire need of replacement,” Eliason said. The city is seeking 50/50 matching funds for the project, which could occur as early as next winter. Fishermen may also notice a new “gut barge boat.” In years past, a private contractor was paid $42,000 a year to transport fish-cleaning refuse to be disposed at sea. A city employee will now perform the function. The 32-ft. Munson Pacman is equipped with a hydraulic crane capable of lifting 2,200 lbs, raising small craft that have sunk and for maintenance tasks. The Salmon Mitigation Grant program paid for the boat. Mariners concerned that activities in the harbors may conflict with their personal plans might consider signing up for Harbor Email Notifications. Boat owners can stay up-to-date with weather alerts, repairs and general harbor notifications. Just go to CityOfSitka.com and click on “Departments” to find the Harbor Department page. printed or online Harbor Guide? © 2019 Sitka Harbor Guide. All Rights Reserved.